I don’t want to admit to you how many times I’ve written and then rewritten this post. What can you say about a potato tian? It’s crispy! It’s delicious! There’s chipotle peppers in it! It looks fancy, but it’s really easy! I wanted to make a sweet potato tian for Thanksgiving, but I couldn’t get it right so I decided to shelve the idea for a while. When I finally revisited it, I was feeling pretty tired of sweet potatoes, so I used Yukon Gold potatoes instead. And then, finally (FINALLY! ), it turned out how I had envisioned. I suspect that Russet potatoes would work out well too, but make sure you buy small ones because the big ones might be harder to pack into a baking dish. New topic! I love using chipotle peppers in my cooking, but most recipes only call for a small amount and then you’re left with an entire can of them sitting in the fridge. Anyway! Here’s what you can do with your leftover chipotle peppers. 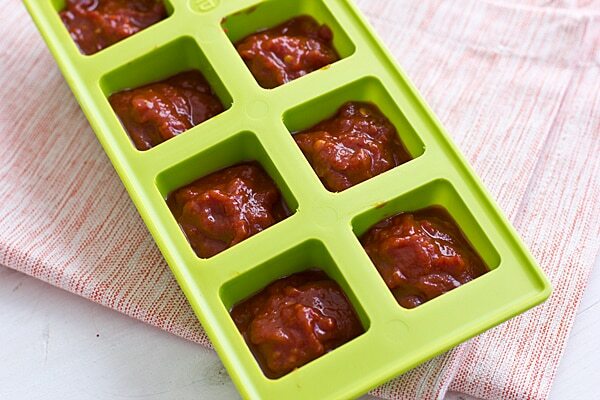 Use an immersion blender, food processor, or countertop blender to puree the peppers and adobo sauce until smooth. You can either freeze them in one small freezer bag or plastic container or freeze single tablespoons of the mixture in an ice cube tray. Each tablespoon equals about one chipotle pepper, so the next time you have a recipe that calls for one, you’ll have them on hand. Thinly sliced Yukon Gold potatoes are baked to crispy perfection in this spicy chipotle potato tian recipe. Whisk together chipotle and olive oil. Brush the bottom and sides of a small baking dish with 1/3 of the oil mixture. Place potatoes standing up in baking dish. You want them to be as tightly packed as possible. Brush tops of potatoes with remaining oil mixture and salt to taste. 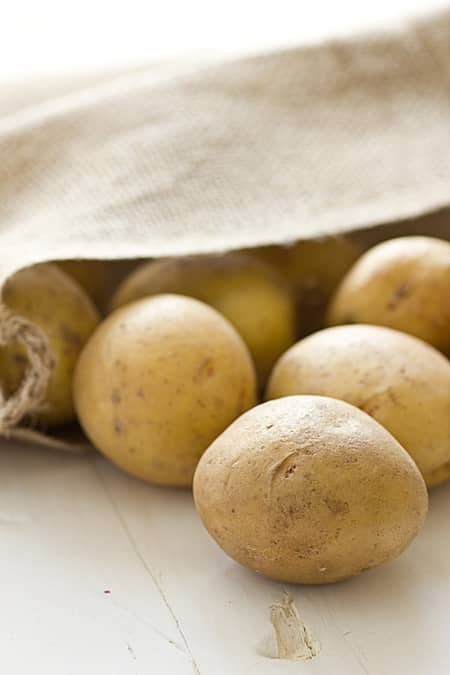 Bake for 75-90 minutes or until tops of potatoes are browned and crispy. this looks incredible! thinking I need to pull out our mandoline and give this a try! Wow, this looks delish! I am always up for new potato dish! Thanks for posting! Man, these sound good. I am all for anything with chipotle. And I love the tip to rescue the leftovers, because even when you use a small can, you use about a tablespoon for each recipe! I know! I hate things like that. Same with parsley, chives–well, just about any herb. And I can’t bear to throw things away. This is perfect! I just made a paste from some dried peppers I had in the pantry, many of which were chipotle. Now I have a couple of dozen of little ice cubes of spice in the freezer. I also just bought a 5 bought bag of organic potato for cheap, so I will definitely be making this. The presentation (if I can get it to look as pretty as yours) will blow the family away and I know they’ll all LOVE the taste! Thank you for this post! Why don’t you try taking out a few of the peppers, blending them up and then slowly cooking them down into a paste with your seasoning of choice. Then you can always refreeze. I usually use dried peppers, but I don’t see why this wouldn’t work. Just a thought. Of course I love frozen peppers of any kind. I pull one or two out, chop it up and throw it into soups, casseroles, pasta, eggs, grits – you name it! This looks great! Definitely something I’m going to be trying in the very near future. We’ve got an ex-pats holiday potluck this weekend, and unfortunately we’ve reached our limit with potato dishes (seriously, *everyone* replied saying they could do potatoes… step up, potluck people!) otherwise I’d give these a try then. I usually just transfer my chipotles from the tin into a glass jar and I find that they keep quite a long time. BRILLIANT! I freeze cookie dough balls, so why not blenderized (is that a word?) peppers too? 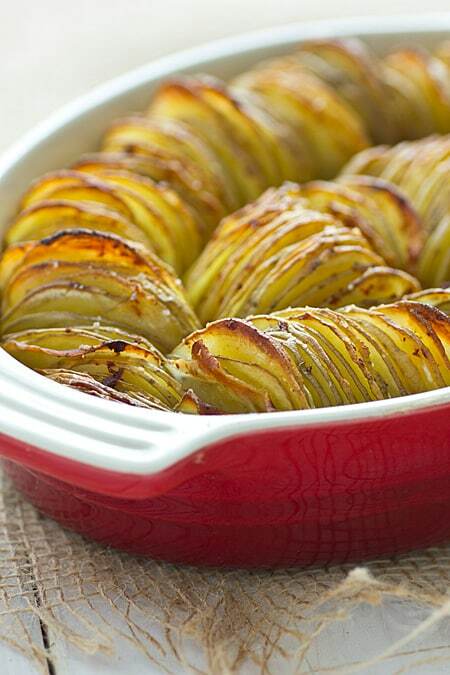 Looks wonderful with all those thin golden slices of potatoes! What a great looking side for Christmas. I love the idea of mixing a classic dish like potatoes with a little cheery color and flavor to mix things up! Thank you! I’ve seen tomato paste in tubes like that, but never chipotle. OH my gosh! These look so great! Thank you for providing such awesome recipes and ideas. As the only vegetarian in my meat loving family I am constantly looking for ways to satisfy all taste buds while being health conscious. I also blog about the vegetarian lifestyle and high protein meals at http://thelivelyvegetarian.blogspot.com/ if you are interested. My family will be grateful for your ideas! Take care! Thanks for stopping by–I will check out your blog! “My mom always told me that people who waste food go to hell” LOL! Sorry… But I really actually laughed at that. Mostly because my mom was the same way with leftovers and passed that onto me. Sometimes it’s not such a good thing, hah. But definitely a good thing thing with chipotles, you know my exact situation with the leftovers in the can sitting in the fridge. I’ve started freezing them and I’m not going back. Although I do need to learn to label better(I once put a chipotle cube in something instead of a tomato paste cube. Heh, oops!. Anyways, I’ve never made a tian like this but it looks so impressive! I need to try this! this recipe looks wonderful. Please can you tell me if you dry the potato slices before packing them into the dish? This looks great. It reminds me of hasselback potatoes. This just looks awesome. So much so that I’m squeezing this in for dinner tomorrow!!! I made a sweet potato version of these for a potluck cookout on Saturday and they were AMAZING. Love love that you’re not going to hell for wasting chipotle peppers. Made me loud out loud! This sounds amazing. Thanks so much for sharing this idea. Potatoes and chipotles. Match made in heaven. Cannot wait to try! It’s definitely a delicious combination! 🙂 I hope you enjoy the recipe! We don’t have yukon potatoes in Australia. Yesterday I made Martha Stewart’s tian provencale which also calls for a yukon. I used some local “pink eye” potatoes instead and it was a great success. Drooling at the thought of trying your recipe, so thank you. Oh, and it’s so pretty! This looks great! I have a potato addiction, so fresh ideas on an old classic are always welcome! Can’t wait to try it. Thanks for sharing this recipe! Wow, this recipe is amazing my husband raved over it! my 4 and 6 year old ate it with out crying it was too hot, so its a winner!